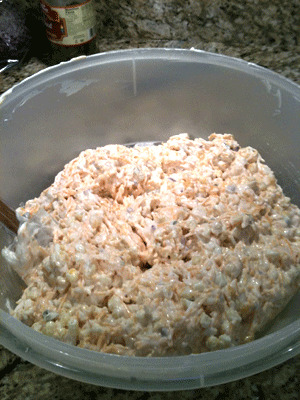 First, this recipe for Sweet Corn Dip makes ALOT as you can see in the photo above. If you are not making it for a party, you might want to share it with a friend. Second, this dip is addicting! I got this recipe from a friend and since then it's been served repeatedly. It's one of those dips that once you start eating, you can't stop. It's really that good. In a large bowl, mix frozen corn that has been thawed, onion, jalapenos, cheese and mayo together, adjusting jalapeno to taste (start with one can and add to taste). Refrigerate at least 4 hours before serving to allow the flavors to marry. The longer it sits the better it is. 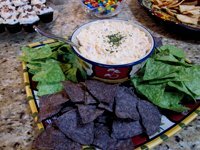 When I make this dip, I serve it with multi-colored, multi-flavored tortilla chips. My favorites are Blue Corn, Guacomole and Southwestern flavored chips (blue, green and red). A great place to buy flavored chips is World Market if you have one close by. Optional: You can substitute a fresh jalapeno pepper. Just seed and finely dice. Also this dip is served cold but you can also bake it at 350 degrees for 25 minutes for a yummy warm appetizer. You will find a few more sweet corn recipes here including my Aunt Judy's Sweet Corn Stuffed Peppers recipe and one for Southwest Corn Chowder, both perfect for vegetarians.